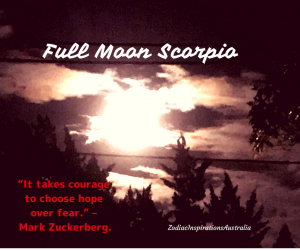 Full Moon Scorpio – to go for what you deeply want!!! The Full Moon of April 2018 is charged with committed light to achieve goals with courage for Self-Empowerment!! The Sun in Taurus and the Full Moon are supported by Saturn in Capricorn in reflection mode (retrograde) inviting us to check the structure of our objectives and the way we must discipline ourselves to be able to achieve them. At 10:58am 30th April 2018 Sydney Time this morning, close your eyes to see the light inside of you and feel the courage and the power within you… to have courage to overcome fears… to work hard to achieve your passion. “It takes courage to choose hope over fear.” – Mark Zuckerberg. Mark was born with the Moon in Scorpio projecting the light of the Sun in Taurus May 14, 1984. Zuckerberg is best known as one of the co-founders of the social networking website Facebook. Remember Mars and Pluto, rulers of Scorpio are still together bringing intensity for us to fuel our passion, leave behind your fears and go for it! Go for what you deeply want!!! The image with today’s post is the Moon last night…so strong it is like a sun rise!! !